These is a great dish for breakfast or dinner. The roast asparagus and hollandaise it just awesome and complements the eggs perfectly. Trim the ends from the asparagus and spread the spears in a single layer in a shallow roasting pan baking sheet, drizzle with olive oil, sprinkle with salt, and roll to coat thoroughly. Roast the asparagus until lightly browned and tender, about 10 minutes, turning halfway through. to combine. Put the butter in a small microwave proof bowl and heat in a microwave until just melted. With the blender running, gradually add the melted butter into the egg to make a smooth frothy sauce. If the sauce is really thick blend in a teaspoon of lukewarm water to loosen it up. Season with the salt and serve immediately or keep warm in a small heat-proof bowl set over hot (but not simmering) water until ready to serve. Prepare the eggs as you wish, poached, scrambled or sunny side. 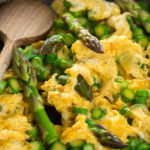 Serve the eggs over the asparagus and drizzle with hollandaise.